We started by flying from Quito to Galapagos early on the morning of November 14th We arrived at the Baltra airport, paid our park entrance fee, met our guide and got on a bus to Puerto Ayora, where we would board the boat. The trip consisted of a short bus ride, a short ferry ride and then another 45 min or so on a bus. 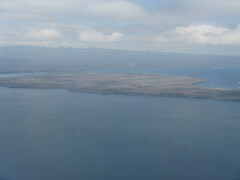 The town was fairly big and is a major port in the islands. We took a dinghy out to the Archipel, where we listened to a brief introduction (Don’t touch the animals! Don’t feed the animals! etc. ), then had a quick lunch before heading back to land and visiting the Charles Darwin Research Centre. This was our first real experience of Galapagos – as soon as we got off the dinghy there were marine iguanas sunning themselves and sea lions lying about. A lot of photos were taken! Little did we know, we would see a lot more of both. 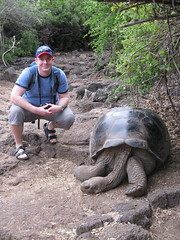 The Charles Darwin Research Centre breeds and raises tortoises in an effort to repopulate the tortoise species on the islands. This is carried out in conjunction with the elimination of invasive species which have led to the decline in the number of tortoises, such as goats, rats, etc. 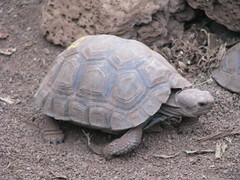 We saw several baby tortoises and also many larger tortoises which have not yet be introduced to the wild. We were not lucky enough to see Lonesome George, who was hiding in the bushes somewhere. Lonesome George is the last remaining tortoise of his species (the Galapagos tortoises have at least one species per island they inhabit). The centre has been trying for years to breed him successfully with other tortoises of a species that is close to his own. So far, all attempts have been unsuccessful. We did see his two lady friends who were hanging out in his area. 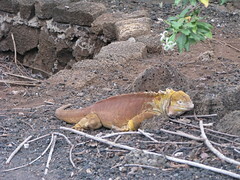 We also saw a few land iguanas that were being kept at the centre. We had the chance to walk through the town of Puerto Ayora and visit a few shops before heading back to the boat for dinner and an overnight sail to Isla Espanola. I was little bit wary of the overnight sail, having never slept on a boat before. But I’ve never been motion sick either. Apparently sea-sickness is worst the first day on a boat, before your brain adjusts to the motion. While we were anchored the boat really didn’t move much, but while in motion it was a different story! Anyway, just to be safe, and because even if the motion didn’t make me ill it would most likely not allow me to sleep well, I took a gravol before heading to bed, which worked out quite well. I don’t think I would have slept as well if it hadn’t been for that!